After presenting at a Web 2.0 Summit last week in Oakland, CA, I got to thinking it would be good to do an update on where we are with Mayo Clinic‘s engagement in social media. We’ve made a lot of progress in the last three years from a completely “old media” focus to a more balanced approach, continually increasing our attention to what Charlene Li calls “the Groundswell.” And hopefully when I do another update in a few months, I’ll be able to look back on many more exciting developments. Here’s a list of where we are as of today in our social media exploration and adoption. For those areas in which I can pinpoint a starting date, I’ll do so. Care Pages – Mayo Clinic provides this service for hospitalized patients, enabling them to provide updates to family and friends on a secure Web page. This helps keep loved ones informed without the undue burden of repeating information by cell phone for each individual, and it enables concerned friends and family to send greetings to the patient. We’ve had this service for a few years, and I know many patients appreciate how it makes staying in touch while hospitalized easier. Podcasts – Mayo Clinic’s first podcast was based on our Medical Edge radio program, and launched in Sept. 2005 through what was then the iTunes Music Store. This gave us our first taste of the potential interest in and power of “new media.” In January 2007 we began offering video podcasts of Mayo Clinic Medical Edge television segments, and in July 2007 followed with extended podcasts in several categories: Men’s Health, Women’s Health, Children’s Health, Heart, Cancer and Bones & Muscles. In April 2008, we moved these podcasts to podcasts.mayoclinic.org, so users could find and listen to individual segments of interest, instead of subscribing to a particular feed. RSS/Web Feeds – Also in Sept. 2005, we began offering really simple syndication (RSS), a.k.a. Web Feeds. You can sign up for Mayo Clinic News from all three campuses (or can choose to receive only Arizona, Florida or Minnesota news), health information news, science news or business-related news. Syndicated Video – Mayo Clinic began using Voxant in 2007 to make its Medical Edge video segments available for syndication to other Web sites. Instead of making people go to our mayoclinic.org site to view the videos, we wanted to put them where people are going, such as in on-line news sites. 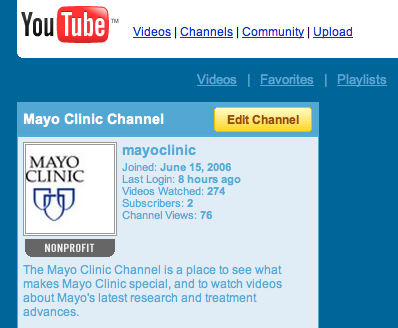 The Mayo Clinic YouTube channel was started just last week; expect to see the look improve significantly yet this month. Here’s our latest addition, a video tour of the new Mayo Clinic Hospital in Jacksonville, Fla.
Facebook – with Mayo Medical School and several other health-related science schools (and with our mayo.edu e-mail addresses), Mayo has had people in Facebook for a long time. In the last six months we’ve seen the number of Mayo participants in Facebook more than double, to over 2,100. When “fan” pages became available to organizations and brands in November 2007, we established one immediately (partly because of what you see when you go to myspace.com/mayoclinic.) We revised and re-categorized the official Mayo Clinic Facebook page in January 2008, and have 1,053 fans as of this writing. In another effort to prevent domain name “squatting,” we also have established accounts in Twitter (twitter.com/mayoclinic) and Flickr. Finally, we’ve begun sponsoring some official blogs. The first was in conjunction with an event, a symposium on innovation in health care in November 2007. It was hosted on wordpress.com and customized somewhat, but we didn’t map to a mayoclinic.org subdomain. We followed that in March 2008 with our Health Policy blog, our podcast blog and a blog about diversity in education at Mayo. These have all started in the last two months, and we hope and expect to continue developing new blogs. Meanwhile, our colleagues at our sister site, MayoClinic.com, which is Mayo Clinic’s consumer health information site, have been starting blogs and a podcast, too. The blogs cover topics like Alzheimers’ Disease, Nutrition, Stress, Pregnancy and Depression. Mayo Clinic is one of the United States’ best places to work (Fortune magazine has had us in its top 100 for the last five years.) I feel exceptionally blessed to be able to work for an organization like Mayo, working with such interesting subject matter during this exciting time of innovation and change in the media world. Next Next post: Can YouTube Beat Facebook Video Quality?